How Florida DOT was able to visualize a complex new intersection design quickly, effectively and at very low budget. 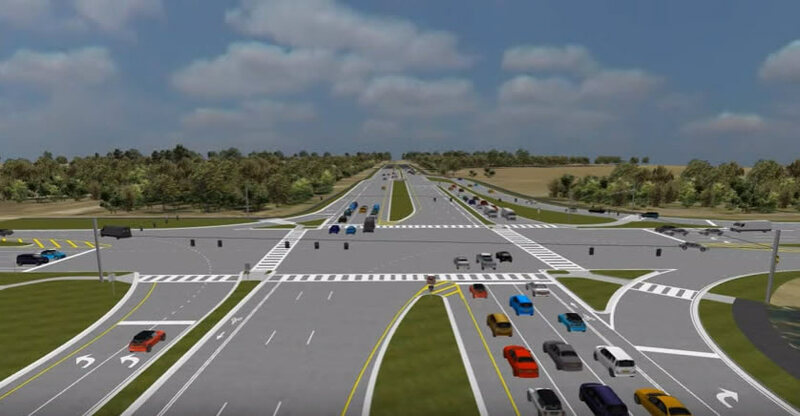 Florida DOT’s challenge was to find a means to educate the public about the operation of Florida’s first Continuous Flow Interchange quickly, effectively and with a small budget. Tasks Dewberry engaged RDV to develop a virtual model of the proposed design that could be viewed in an interactive Google Earth type of environment showing VISSIM-based traffic movements for an entire intersection signal cycle. Actions A detailed 3-D model of the proposed intersection and surrounding existing conditions was developed including the designers’ own files and Vissim traffic modeling that goes through one complete traffic signal cycle, and is coordinated with traffic signal light changes. Dewberry used the 123BIM Navigator(TM) desktop app to create customized camera motion paths within the model, to which they added voice-over, logos, and a few overlays. Results The entire project from beginning of modeling to finished video took less than 2 weeks. Dewberry used RDV’s desktop application to present the intersection at a public education meeting on September 2016 and a 123BIM VirtualTour(TM) was created, allowing the public access to the model using web browser only. The customized video created by Dewberry has been posted by Florida DOT on YouTube.